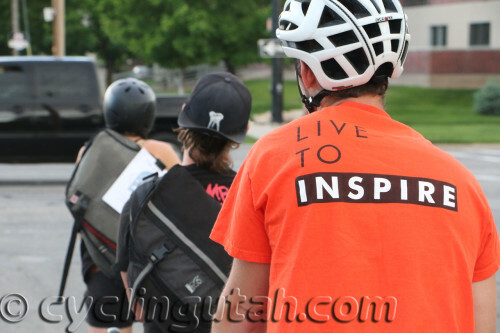 Salt Lake City – On May 21, 2014, thirteen or so riders rolled out of the Gallivan Center in Salt Lake City for the annual Ride of Silence. The ride started in Texas in 2003 following the death of local cyclist Larry Schwartz and has been held every year since then to honor killed or injured cyclists. On the ride’s main website, RideofSilence.org, it is stated that, “The mission of the world wide Ride of Silence is to honor bicyclists killed by motorists, promote sharing the road, and provide awareness of bicycling safety.” The ride takes place each year on the third Wednesday in May in locations around the world. The slow paced ride, maximum speed 12 mph, 8-12 miles total, takes place in silence to honor fallen cyclists. This year, there were 314 rides around the world including one in Provo and one in Salt Lake City. 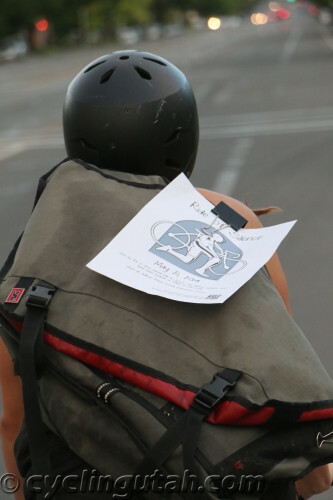 Salt Lake’s ride was organized by Tegan Feudale. “As a bike messenger, I’ve been hit multiple times in the past year. And, I’ve been seeing a lot in the news about people have injured or killed, and I think it’s really important to create awareness that this is something that happens and try and to stop if from happening so often,” said Feudale when asked about why she organized the ride. The ride set out from the Gallivan Center and stopped at the courthouse on State Street where she read Ride of Silence poem to honor Judge Anthony Quinn, who was killed on his bike in Millcreek Canyon in 2013. The route continued through downtown towards Liberty Park, where it stopped at the corner of 8th South and 700 E. to honor Brynn Barton, who was killed in a hit and run in 2011. The ride made a loop through Liberty Park, and then back through downtown to the Gallivan Center. 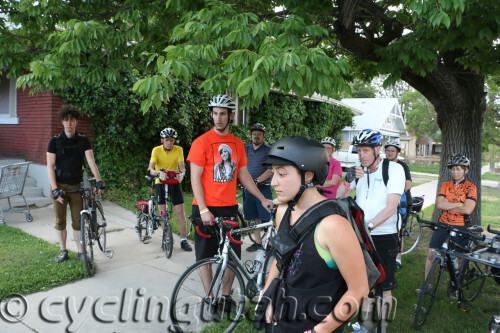 While most who came out were there to honor all cyclists who have been killed, and for bicycle safety, one rider was there for deeply personal reasons. Kjarsten Christensen was their to remember his friend Brynn Barton who was killed in 2011. [See the accompanying story for an account of the crash.